1.Question – What are Vacuum Copper (Cu) Ring Gaskets? Answer – Vacuum Copper (Cu) Ring Gaskets are copper rings used for making a vacuum-tight connection between two Vacuum CF Flanges. 2.Question – How is the vacuum-tight connection made? Answer – Vacuum CF Flanges have a special shaped knife edge for sealing with the use of the copper ring gasket and bolts to pull the Vacuum CF Flanges together, the copper ring gasket is deformed to the specially shaped ‘knife edge’ in the Vacuum CF Flanges to create the vacuum seal. 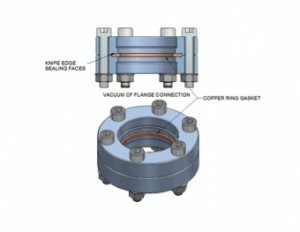 The connection can be made only once, if the mating Vacuum CF Flanges are disconnected a new Vacuum Copper (Cu) Ring Gaskets must be used. 3.Question – What are the standard sizes for the Vacuum Copper (Cu) Ring Gaskets? Answer – Vacuum Copper (Cu) Ring Gasket sizes are designated by their bore diameter matching the Vacuum CF Flange sizes. The standard designations are Cu. The dimensions for these sizes of Vacuum Copper (Cu) Ring Gaskets are to the Vacuum Industry Standard. 4.Question – What Material are Vacuum Copper (Cu) Ring Gaskets manufactured from? 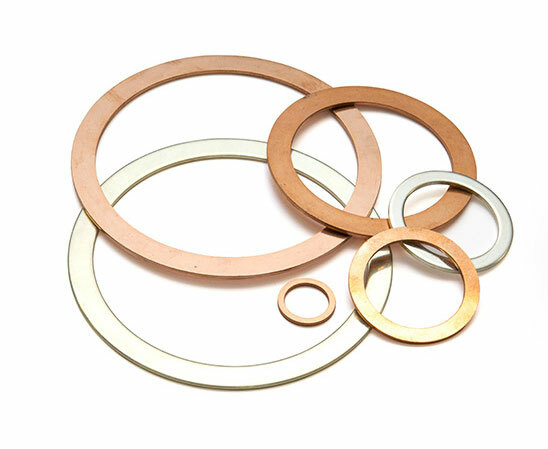 Answer – Vacuum Copper (Cu) Ring Gaskets are predominantly manufacture from Oxygen-free High Conductivity Copper (OFHC), the Vacuum Copper (Cu) Ring Gaskets are available in hard, annealed and silver plated versions. Hard – Pure copper is soft and can be shaped to suit the desired size for Vacuum Copper (Cu) Ring Gaskets, the process causes the copper to become what is termed as ‘hard’ and is supplied in Vacuum Industry Standard sizes. Silver plated – Un-plated Vacuum Copper (Cu) Ring Gaskets oxidise in a corrosive vacuum environment or when baked to a high temperature in vacuum, this can cause black deposits like soot to deposit on the Vacuum Copper (Cu) Ring Gasket, to prevent this Vacuum Copper (Cu) Ring Gaskets are silver plated. They operate the same as un-plated versions. Question – What Temperature can Vacuum Copper (Cu) Ring Gaskets be used up to? Vacuum Services Ltd do not have a minimum order quantity if your needs are for 1 off flange, centering, gasket or clamp and we receive an order before 2.30pm we will ship to you the same day. Click here to view our catalogue that shows the complete range of sizes available. If you cannot see what you are looking for in the catalogue please feel free to email or call us to discuss your requirements.